The remarkable thing about engineers, or the ones I’m blessed to be around a lot, is that they are pretty great problem solvers. Sometimes, while not really setting out to change the world, they do just that. We can thank one engineer I have the privilege of calling Uncle Bill for a simple container we now take for granted called the aluminum can. William “Bill” K. Coors is almost 99 now, and still has a very sharp mind. The room grows quiet when he starts to speak in anticipation of another fascinating story from his lengthy career. Listening to him talk about the genesis of the aluminum can, he is very humble and quick to credit those he worked along-side in the endeavor. To him, he just solved a problem that was important to the family business. He down plays its importance in history and laughs fondly when recalling how everything came together. Laughter aside, it clearly took a great amount of innovation and determination to pioneer such a revolutionary product. The problem that Bill set off to solve was love/hate relationship people had with the tin-coated steel can, which had been in use in the industry in various forms since 1933 when prohibition ended. The can was well-liked by the beverage industry and consumers alike for its convenience. From the soda and beer industry perspective, the tin can was lighter than glass, and only required one way shipping, saving manufacturers quite a bit of money on freight and fuel. Consumers viewed it as a “throw away” can, which, unfortunately, is exactly what they did with it. They threw it away anywhere they pleased, on the side of every road, into various rivers and streams and throughout neighborhood parks. The landscape was covered with tin cans. “Ban the Can” became an environmentalist mantra in the 1950’s. Bill was battling his own feeling of disdain and respect toward the can. He didn’t like cans littering the environment and he didn’t like the off-putting metallic taste tainting the beer. Plus, the tin cans had solder seams that made Bill’s vision of sterile-filling cans impossible. 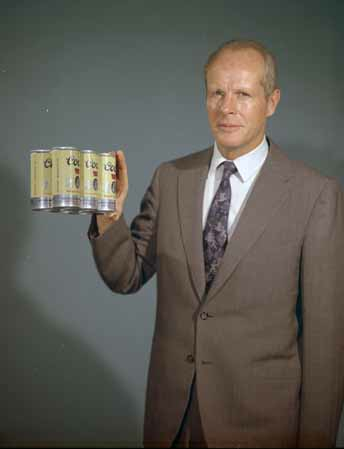 However, the costs savings associated with cans allowed him to compete in markets farther away from Golden, Colorado, like Chicago, so he knew it was quite a valuable container for the future of his family business. In the 1950’s, in the midst of the tin can controversy, he was introduced to Lou Bronstein, and Lou’s idea took root in Bill’s mind. The story goes that Lou was a consummate promotor who had won and lost several fortunes (and wives) during his lifetime. This wasn’t snake oil he was pitching to Bill, though, and Bill understood immediately that this colorful man was onto something. Lou’s idea was to develop a seamless, all-aluminum can. Aluminum was soft and could be formed into a can without solder seams, which would allow Bill to go forward with his sterile-fill efforts. If the cans were made of aluminum instead of tin and steel, the scrap metal price would be also high enough to incent people to pick them up and recycle them. Plus, aluminum was easy to recycle. It took approximately 1/30th the energy to make aluminum from recycled material than traditional methods. Making new cans from old cans was a very sustainable business model. The environmental impact as well as the savings to the manufacturer made aluminum an ideal container. Best of all, the beer would retain a pure, clean flavor. Bill convinced his family to allow him to spend a little money setting up a pilot aluminum can operation, something that had never been done before. With their support, he and Lou set out across Europe purchasing equipment and tools, and gaining necessary knowhow. Their plan was to make an impact-extruded can line using technology similar to what was employed at the time to make aluminum toothpaste tubes. Back from his European travels, Bill put together a team of engineers and equipment designers, mostly from those already employed by his family in the porcelain business. In the early 1900’s, the Coors family owned a pottery company, which, until World War I, made primarily bakeware, dishes and mixing bowls. With the onset of the war, the transition into more advanced chemical and scientific porcelain and ceramic goods began. By the late 1950’s, there were several engineers on staff to tap for the aluminum can project. That ceramics company is still family-owned, and is now known as CoorsTek. Bill and his team’s efforts attracted the attention of some powerful dissenters. His own United States Brewers Association took a strong stand against his project. Longtime friends in the beer, soda and container industries would no longer associate with him. One asked to meet with him in the dark corner of out-of-the-way hotel coffee shop to warn him to stop his quest. One hired an academic expert to present his findings that recycling flew in the face of human nature. The beer and soda industries, and their container suppliers, were adamantly opposed to taking any responsibility for what consumers did with the empty cans; the litter problem was a consumer problem, not a manufacturers’ problem. Nonplussed, Bill politely disagreed, and forged ahead with his efforts to create a can that would benefit both his family’s beer company and the environment. After two years of hard work, long hours and many frustrations, in 1959, the recyclable aluminum can was introduced to the market in a 7 oz. size by the Adolph Coors Company. Consumers loved it. Bill knew very quickly that this was something the market had to have. He had very little can manufacturing capacity, and would need other suppliers, so he sold the full engineering package, everything someone needed to know to make the all-aluminum cans, for $300,000 to anyone who was interested. His first buyer? None other than the company represented by the man he had met in that out-of-the-way hotel coffee shop. As the leading container suppliers saw that it could be done, and more importantly it had very strong consumer demand, they all came calling on him. You can tell that redemption felt wonderful as he talks about making those first few sales, but he’s not one to relish very long is his moral victories. With the new aluminum can in the market, it still took a while for recycling to spread outside of Coors’ home market. Coors led those efforts out-of-state as well, offering a penny per can returned, and requiring each of its distributors to accept the return of any empty aluminum cans. Reluctantly, those Coors distributors got into the junk metal industry and wider-scale recycling was finally happening. Again, his competitors in the beer industry, and peers in the soda industry, begrudgingly followed his lead. Soon this crazy recycling idea Bill had been advocating was mainstream. So, “Cheers” to Uncle Bill and his team, whose vision, perseverance and engineering mind has made such a profoundly positive and lasting impact on our daily lives and our environment.